This weekend, Don Ahrens announced that he wouldn't be posting the BayCHI job list anymore. This important job listing is on hiatus till another owner can be found and trained. It's easy to say Don did the user experience profession a great service with this list, but it's very hard to imagine where some of us would be without it. The BayCHI chapter of the Special Interest Group of Human Computer Interaction (SigCHI) is a major force for professional good, offering great talks by industry stars and important networking opportunities. (I just looked at their page and discovered that a friend from the UK whom I haven't seen in 10 years is speaking this month, and I'm missing it!) The Bay Area is the spiritual home for user experience professionals, rivaled only by some odd corners of Scandinavia. That job list, to which many non-locals subscribe, is one of the best ways to track industry opportunities in interaction design and usability. Watching that list gives one important insights into what's going on at major software companies. Jobs outside the Bay Area are regularly posted there, because of its large readership and the recruiting pool that exists in the Bay Area. I myself have been reading it since grad school. In honor of Don's tenure (how long HAS it been? I can't remember when he didn't run it!) I've made a few retrospective graphs of the job list contents from 2003 to 2006. Unsurprisingly, the growth of the stock market matches the growth in the raw number of job postings appearing on the baychi list. We're averaging around 70 to 90 jobs every weekend right now, incidentally. 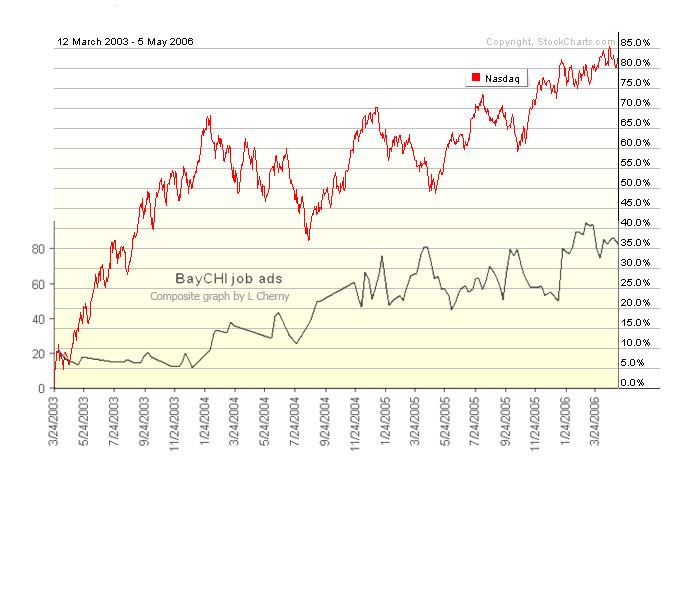 This picture shows the raw counts of job posts overlaid on the percentage growth of the NASDAQ. If we look at the actual companies posting jobs, it gets more interesting. By raw counts, you see some of the big tech names you'd expect to see. Check out the major players in user experience on the left edge. Now, these are dumb data points -- we know nothing about actual filling of positions, or how many times a job was reposted or how many positions each posting represented. One major caveat there: the Google NY jobs have been open for almost a year, I think, without disappearing, so this is inflating some of their stats. 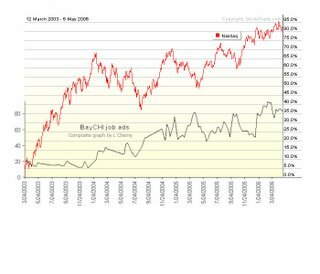 The Trend Micro positions in East Asia were likewise open forever. Regardless of the potentially misleading nature of these numbers, the stats do get more interesting when you compare the size of the company with the number of UX jobs posted on the baychi list. For the public companies that I could track down, I resorted by the higher ratios, and this shifts the list tremendously. Microsoft, for instance, falls way back down, as does Oracle. Senior interface designers top the most wanted (or bottom, in this graph). Usability and user research positions trail rather in comparison. This is actually a nice trend for the industry, since Don Norman noted a few years ago that "design is where the action is." As a hiring manager seeking senior UI designers, their popularity is bad news for me; it's very, very hard to hire them. There aren't enough, and they're clearly in high demand. According to my BayCHI Job Bank archive, Don Ahrens took over from Jeffrey Chan in May, 2002. Since then, Don has sent out 195 weekly emails. Since the announcement last weekend of Don's stepping down as BayCHI's volunteer job bank coordinator, we've heard from several potential volunteers to take over. It's a big job, and Don set a high standard! Thanks, Steve. That's a lot of email. Don did an amazing job for everyone. Oracle ?!?!?!?!!!! Well, paint me magenta and call me a hamster. That begs a very big question, or maybe just a 3 letter one - arranging the letters T, F and W to form a well known phrase or saying. Have you ever run their software? If ever there were a 'we use Java because we don't care' UI then Oracle's is it. Ah, mr weasel. Oracle has had a spotty history with how well usability and UI people do there, from what I recall. Usually places with troubled environments reflect it in the products :-) also, check how low they fall when you take into account the size of the company. 284 job ads from them is about, oooooh, 284 more than I would have expected having enjoyed their software. I would assume their process is 'oh, throw any old crap together in Java, no-one really cares, in fact don't even bother to make the terms you use for things even vaguely consistent'. I saw your post about my new position, VP of User Experience at Rearden Commerce. I agree it's an unusual title -- most companies make a small investment in user experience, and top the group with a director that reports into product marketing or engineering. Rearden wanted to make a substantial investment, and have UE play a more strategic role in the business. They recruited me to create an entire group around User Experience and transform their B2B caterpillar into a B2C butterfly. Other larger companies (Yahoo! comes to mind) that have substantial UE investment occasionally have a VP in that role as well, but it's certainly a rarety in a smaller company.